I have now decided how the robot will move mechanically. 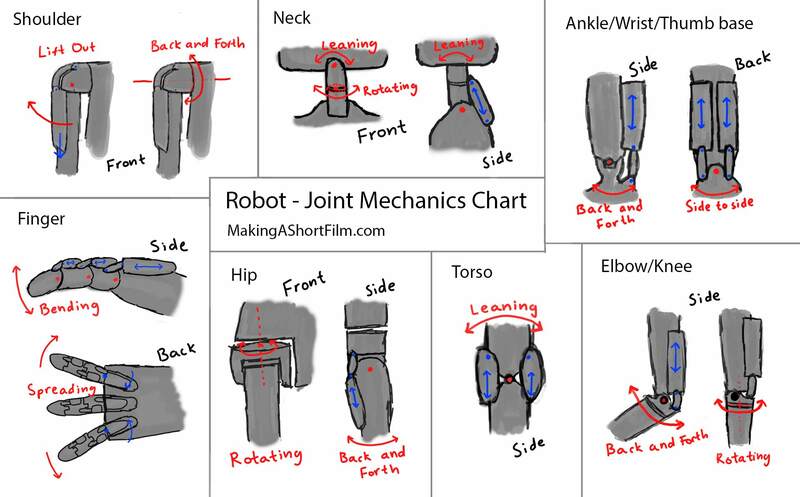 As you can see, I don't have a unique design for each joint, in that the knee and elbow share the same design, and the wrist/ankle shares the same one as well. This is because these joints have the same range of motion, which means that they can be built the same way. Also, by doing this, I not only reduce work, but I get a more coherent design where different parts of the robot is built the same way. To explain what you are looking at: Red shows the resulting motion, what the robot "wants to achieve" when it moves. Blue shows mechanical motion that makes it happen. Arrows shows motion and dots are rotation points. On the elbow for example, the blue part will move down, pushing the arm into bending. The "Front/Side/Back" simply states which view the joint is presented in. As for the philosophy of the design, I wanted to make them look and work like muscles. For example, the calf pulls the heel of the foot, just like on a person. The goal was to design the mechanics so that every degree of motion would be visible from the design, hopefully making it more natural. By just looking at the robot, you can see how it will be able to move. The design above is very simple, not showing any of the inner workings. We only see the "muscles", not how they actually move. I imagine it to be some kind of rail system underneath that they slide along. For the final design, I might keep it this clean, or show more of the mechanics beneath by including these rails. It depends on what I think of the design I come up with. If it looks naked and I want more tiny details, I will include them, and if I like it smooth and clean, I will not. (Realistically speaking, an actual robot would want as much as possible covered up to reduce the risk of things getting stuck and it malfunctioning. Using clear plastic is one option, allowing details to show while still protecting them. However, since this is a film, what looks best is of course most important in the end, as long as it isn't too unrealistic). So, now I know how the robot will work. Next up is to find the general shape of the body, hopefully making the Robot looking unique, while at the same time pleasing to look at. See you next time!